The Harland & Wolff ship building company stands on Belfast’s river Lagan. 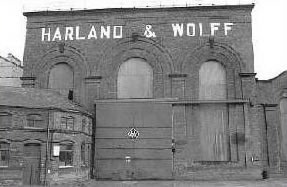 The company have been building ships since 1853, but the company didn’t trade under the name “Harland & Wolff” until 1st January 1862. In 1870, Harland & Wolff built their first White Star owned vessel, Oceanic, and over the years, they built more than 70 vessels for them. Thomas Andrews was the Titanic’s chief designer, and Managing Director at Harland & Wolff. Andrews was also head of the draughting department. He was responsible for producing every drawing for every part of the ship. He would later be on the Titanic’s maiden voyage taking notes, to provide alterations, suggestions and improvements to Titanic, Olympic and the yet to be built Britannic. The ships were built on a “cost plus” basis, which basically meant that all of the bills for materials and labour were passed on to the White Star Line, with Harland & Wolff’s profit margin added on. Ships were increasing in size at an incredible rate around the turn of the century, and to ensure that they could accommodate these larger vessels, Harland & Wolff had to construct larger docks together with bigger slipways. The builders of the Forth Rail Bridge near Edinburgh in Scotland, Sir William Arrol and Company Ltd, of Glasgow, were brought in to construct a huge new gantry that had been specially designed by the shipyard’s own staff. At 840 feet long, by 240 feet wide, it could accommodate two Olympic class liners side by side. At the time of the liners’ construction, about 15,000 people worked at Harland & Wolff’s Belfast yard. They worked a forty-nine hour week, with only half an hour for lunch, receiving about £2 per week. They only had one week’s holiday in the summer, plus two days at Christmas, and two at Easter. Despite the tough working conditions, there were only eight fatalities reported during the Titanic’s construction, five of which were actually on the Titanic.